The Emperor And The Assassin (original title: 荊柯刺秦王) is a movie about the rise of the First Emperor, directed by Chen Kaige and released in 1998. At the time, it was China's most expensive film ever produced. 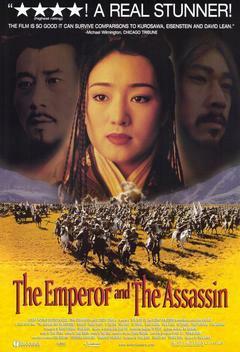 It starred Gong Li as Lady Zhao, Li Xuejian as Ying Zheng, and also had Zhou Xun in a supporting role. In the third century BCE, as China is in the throes of the Warring States era, the ruthlessly ambitious Ying Zheng turns his realm of Qin into a fearsome military machine and poses a growing threat to the existence of the six other kingdoms. Ying's favored concubine, Lady Zhao, suggests a ploy that would give Qin a casus belli to invade the rival state of Yan: she will have her face branded and use it as a pretext to defect to Yan, where she will convince the king to send an assassin to kill Ying. The best hit man in Yan, Jing Ke, is chosen for the mission, but Lady Zhao discovers he has chosen not to kill again, and is living the rest of his life as a beggar. As she learns about the circumstances of his choice, Lady Zhao begins falling in love with Jing Ke, and after witnessing the brutal slaughter of children by the Qin army in her home state of Zhao, genuinely allies with Yan against Qin and wants the assassination attempt to succeed. Jing Ke, however, fails to kill Ying, and the latter is now free to complete his takeover of the land and become Qin Shi Huangdi, the First Emperor of China. Armor Is Useless: Averted - the Emperor's life is only saved because he's wearing armor under his robes. The Atoner - Jing Ke gives up on his life as a hit man after his last assassination involved killing a swordsmith and his entire family. However, he spared the smith's youngest daughter because she was blind. Unfortunately, the girl took her own life, and dies out of anger for Jing Ke for robbing her of her family. Ultimately, he only agrees to kill Ying Zheng because he actually thinks it's the right thing to do. Beard of Sorrow - When Jing Ke becomes a beggar out of sorrow, he sports the requisite unkempt look. Even branded on the face with a hot iron, Lady Zhao remains beautiful. Bystander Syndrome: When Jing Ke starts attacking Ying, everyone in the Imperial court just watches in shock. After Ying fends Jing off and kills him, he herds the entire court away by angrily yelling at them that not one of them tried to help him. The Conspiracy - The Marquis of Qin, Chang Xin, plans a coup d'etat to remove Ying Zheng from power, so as to place one of his sons (which turns out to be Ying's half-brother, due to Chang having fathered two sons...with Ying's mother, no less) on the throne. This is a result of him losing faith in Ying's radical decision-making, which includes starting his war to unite China and removing the Prime Minister Lu Buwei of Qin from office. Cycle of Revenge: Ying Zheng is aware of this trope (it happened to him after all) and so orders all the children buried alive so they won't grow up to take revenge. Defector from Decadence - Ying's head general, who begins to lose faith in his king's methodical ways of eliminating his political opponents. Directed by Cast Member: Chen Kaige plays Lu Buwei. Empathy Doll Shot - Subverted as Lady Zhao arrives at a ransacked Zhao capital too late and finds small drums and other children's toys littered across the ground. Upon further inspection, she proceeds to find the kids as well... buried alive. Foregone Conclusion - Since Ying Zheng will become the First Emperor of China, Jing Ke must obviously must fail the assassination attempt. Good Scars, Evil Scars: The brand on Lady Zhao's face is small enough that it doesn't detract from her beauty, but presumably the severe pain involved was the selling point in her scheme with the emperor. HeelFace Door-Slam: Jing Ke gets one at the beginning of the movie when the blind daughter refuses his "pity" and commits suicide cursing him. Ying Zheng will have another at the end of the movie, when Chang Xin does exactly the same to the Emperor. Hourglass Plot: The movie begins with Jing Ke after he has crossed his Despair Event Horizon because his HeelFace Door-Slam, and Ying Zheng, loved by Lady Zhao, is full of hope trying to build The Empire because Utopia Justifies the Means. The movie ends with Jing Ke dying knowing he is loved by Lady Zhao and that he tried to make up for all his sins, while Ying Zheng crosses his Despair Event Horizon after his own HeelFace Door-Slam, being Lonely at the Top with 0% Approval Rating. Hypocrite: Destined to be The Emperor Ying Zheng and Professional Killer Jing Ke both have crossed the Moral Event Horizon a long time ago, but they havent cross the Despair Event Horizon until the movie begins: When both of them attempt to Pet the Dog, The Dog Bites Back by HeelFace Door-Slam them, ensuring the emperor and the assassin get a Heel Realization. Infant Immortality - BRUTUALLY averted. A young girl commits suicide, and all the children in the Zhao capital are buried alive. Kick Them While They Are Down - When Chang's forces have found themselves surrounded in the palace courtyard, Ying demands their surrender. They don't at first, but a few volleys of arrows convince the survivors to lay down their weapons...at which point, Ying orders Chang's men to be slaughtered, anyways. Obfuscating Stupidity / Scheherezade Gambit: Realizing his target is watching him like a hawk, Jing Ke pretends to collapse in fear and confesses he's been sent to kill the Emperor. Ying Zheng is so overjoyed at this (it's exactly the pretext he needs to launch his invasion) that he lets his guard down. Phrase-Catcher: Invoked by Ying Zheng, when he orders a servant to always say to him: "Remember that your destiny is to unite the six kingdoms". You Can't Fight Fate: Being a Historical Fiction, this movie has a Foregone Conclusion. The movie exploits this trope by showing Jing ke and Ying Zheng sincerely trying to refuse to cross the Despair Event Horizon by Kick the Dog. So, even when their HeelFace Door-Slam sets both of them as The Atoner, Jing Ke continues to be a Professional Killer in an attempt to kill Ying Zheng, and Ying Zheng becomes The Emperor because all the crimes he had done need to be justified by assuring an Empire with Peace. 0% Approval Rating: EVERYBODY hates Ying Zheng by the time the credits roll. To the point where not a single subject lifts their hand to defend him during the assassination attempt. More likely a case of Bystander Syndrome. This is a case of Truth in Television. Ying Zheng forbade officials from carrying weapons in the throne room, thus when the assassination attempt occurred, nobody present had any weapon to defend the First Emperor.